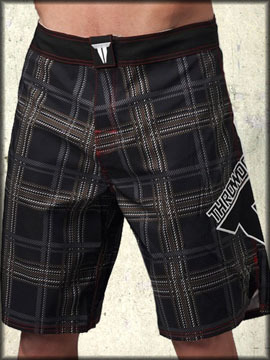 Throwdown Plaid To Fight men's black board shorts features dark grey plaid pattern all over the front and back. Throwdown T logo in black and white print on one leg. Throwdown Logo Waistband, EZ Fly, Logo Eyelets, Front Logo Patch, Back Waistband Logo, 4 Way Performance Stretch, 12 inch Rise, 22 inch Inseam. Fits true to size. Color: black and grey plaid.